Blocking WhatsApp spam message in iPhone is quite easy. You only need to follow some easy steps, and no third party app is required to block WhatsApp spam. 1. Open WhatsApp, and click on the number from which you have received the spam message. 2. 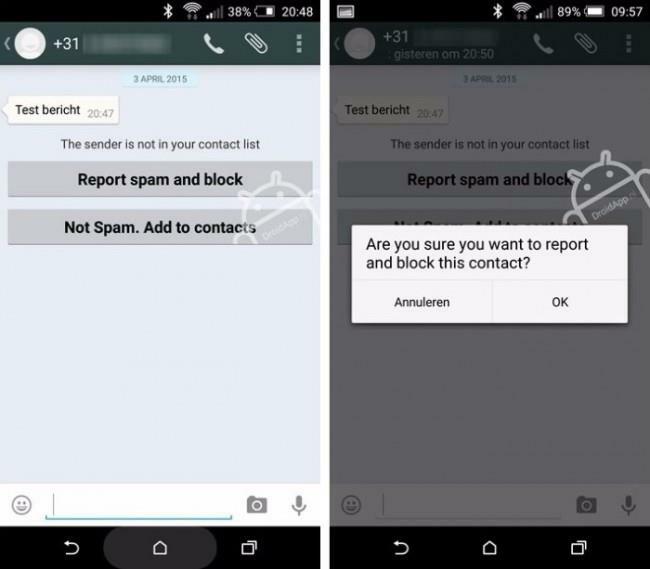 By opening the message screen of the spam number, you will see two available options: “Report Spam and Block and a Not Spam, Add to Contacts”. 3. By clicking on“Report Spam and Block”, iPhone users will be directed to a dialog box, which states: Are you sure you want to report and block this contact. 4. Click on “OK” if you wishtopreventthe contact from sending spam messages, images or videos on WhatsApp. 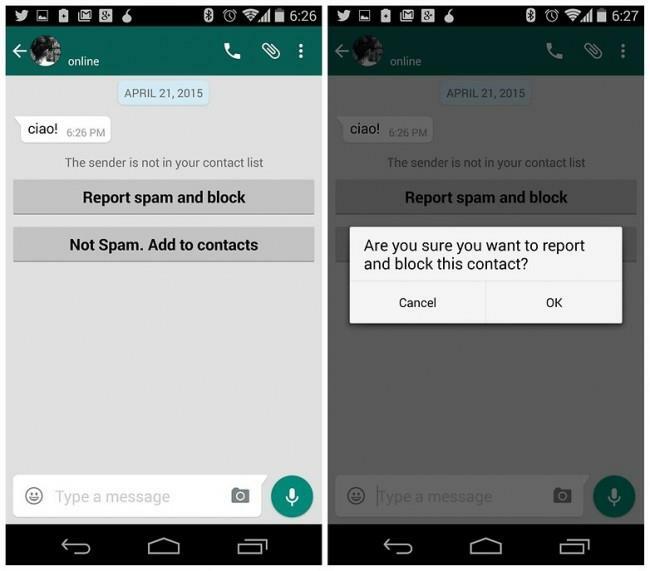 If you are receiving spammy messages on WhatsApp, you now have the option to block the contact or report it as spam. If you are an Android phone user, follow the steps to block WhatsApp spam. 1. First of all, download the latest version of WhatsApp from Google Play Store to use the new report spam or block feature. 2. Open WhatsApp, and click on the chat from an unknown number. 3. You will see the options: “Report spam and block” or “Not Spam. Add to Contacts”. 4. Choose the option, for which you are sure. 5. If you click on “Report Spam and Block”, a dialog box will appear, asking you to confirm your action. 6. Click on “OK” if you want to block the spam contact on WhatsApp. In recent years, WhatsApp Messenger got immense popularity among people of every age group. As a result of this, the number of fraudulent and spamming activities have also increased to great extent. Various spamming activities should be taken care of rightly to keep your WhatsApp conversations as well as your smartphone secured from hackers and spammers. 1. Malicious Links: Following malicious links is a way to attract hackers or cyber criminals. Nowadays, spammers and hackers are using this technique to scam WhatsApp users. One good and recent example of this is the message sent to WhatsApp users, asking them to follow a link that states, “update the app”. WhatsApp does not send such messages, and the link said therein do not led to any kind of update. By following the link, the users will be asked to sign-up for an additional service. Additionally, following the link will lead to hefty surcharge to your phone bills. If you don’t want to receive spam messages on WhatsApp, do not follow such malicious links. 2. Advertisements: Most of the spamming activities tries to direct website traffic to gain money from advertising. This simply means that spammers have to get a various number of people to focus on the ads, they are using in the form of scams. When it comes to WhatsApp, scammers use different apps to transmit malware or another fallacious thing in the devices of a large number of people. In this way, they are directed to visit a website that is under false pretenses. For example: under spam campaign, people are asked to test the new WhatsApp calling feature or anything else. This is a type of textbook scam, and instead to getting that feature, victims unknowingly spread misleading spam messages. So, do not go for such advertisements, in order to be a victim of WhatsApp Spam. 3. Premium Rate Messages: Premium rate messages is the fastest growing malware threat for smartphone users. WhatsApp Messenger is giving cyber criminals an effective way to engage people in malicious activity. In this spamming technique, users receive a message, which asks them to send back a reply. For example: “I am writing to you from WhatsApp, let me know here if you are getting my messages” or “Get in touch with me about the second job interview”, and various other sexual themed message. By sending a response to such messages, you will be automatically redirected to a premium rate service. This spamming technique is very popular nowadays. So, if you want to stay away from such spamming activities, do not reply to these type of messages. 4. Fake Invitation of WhatsApp Voice Calls: Users receive WhatsApp spam email in the form of a fake invitation to access the new feature of WhatsApp i.e. WhatsApp voice calls. By sending such WhatsAppspam email, cybercriminals are spreading the malware in the form of a link. By clicking on the link, malware is automatically downloaded in your smartphone. So, do not entertain such WhatsApp spam emails to keep yourself away from being a victim of spamming. 5. Use of WhatsApp Public App: WhatsApp Public is an application, which gives users the advantage to spy your contacts in the app. The scam associated with this offers a service, through which anyone can read other’s conversation. This is a spamming activity, as you cannot spy other’s conversations. So, by avoiding such apps, you can get rid of being a WhatsApp,spam victim. Make your conversations healthy and secured on WhatsApp, and avoid being a spam victim, through the use of above tips. Supports various file typles, including Messages & Contacts & Photos & Videos & Audio & Document & WhatsApp.